Live it up, lad! We won't let you down. 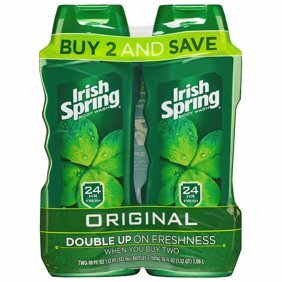 The crisp, clean freshness of Irish Spring lasts through all your adventures, and then some. Irish Spring Deep Action Scrub body wash is inspired by the coarseness of Celtic rock salt and the crisp winds that erode the Irish coastline. Its exhilarating scent and rich lather will transform you from rough to ready. Ingredients: Water, Sodium Laureth Sulfate, Acrylates Copolymer, Cocamidopropyl Betaine, Parfum/Fragrance, Hydrogenated Castor Oil, DMDM Hydantoin, Sodium Hydroxide, Sodium Chloride, Menthol, Hydrogenated Jojoba Oil, Prunus Armeniaca (Apricot) Seed Powder, Tetrasodium EDTA, Citric Acid, Green 3, Yellow 5. This product keeps you fresh and clean for a long time. I love the smell and cleanness it gives my body. I will buy again. I'd never used any body wash with lava rock in it before and tended to stick with super smooth and more feminine body washes. My boyfriend uses this body wash and I had to try it out once when I left mine at home. The smell is not overpowering at all and I love that about this body wash. Doesn't smell like you just bathed in cologne or perfume, but also does not have a super strong masculine smell to it. It's a subtle smell that doesn't linger. The harder granules of this body wash help to exfoliate and keep your skin looking healthy. I haven't had any eczema flare ups at all since using this and will continue to use it because of how well my skin appreciates it. This body wash has a great lather. it rinses clean . It really works great beat body wash in the market . It has a great lather that sticks to you and cleans you really good . The beat body wash on the market for cleaning and making you smell good. It really cleans your body good. it just doesn't cover up the dirt it cleans the dirt off. Way better than all those other pretty smelling body washes . This body wash actually cleans you very well. From the fresh clean scent to the scrubbing action this body wash is the best on the market!